Home Mattress Basics Am I Allergic To My Mattress? There are two common types of mattress allergies: latex allergy and dust mite allergy. The average adult getting the recommended seven hours of sleep a night spends 2,555 hours on his or her mattress a year. Naturally, if there are persistent and inexplicable health issues, it makes sense to question whether the mattress itself may be contributing to the problem in some way. The best way to know for sure whether you’re one of the 20 million Americans allergic to dust mites or more than 3 million Americans allergic to latex is to be tested by an allergist. However, here are a few signs and symptoms to look out for, in addition to product suggestions to help you get a more comfortable night’s rest. Symptoms from mattress allergies may include everything from headaches, joint aches and arthritis, to unexplained rashes, eczema and lumps, to nausea, dizziness and persistent flu-like symptoms. Allergic reactions are more common in people with already diminished immune systems or genetic history, but they may stem from several different triggers. Can dust mites in mattress cause allergies? YES! Dust mites and their waste products are one of the most common causes of year-round allergy and asthma, according to the Asthma and Allergy Foundation of America. Symptoms of a dust mite related allergy include: persistent sniffles and/or chronic nasal congestion, sinus headaches, waking with scratchy eyes, sneezing repeatedly first thing in the morning. Dust mite allergy is common among children and a risk factor for developing asthma, according to Dr. Thomas Platts-Mills, director of the Asthma and Allergic Disease Center at the University of Virginia. Do I have a latex mattress allergy? There are three types of latex reactions. The first is a localized rash called irritant contact dermatitis. This type of allergy is not plausible unless you are directly touching or sleeping on the surface of a latex mattress. Latex mattresses are generally encased with layers of fabric and wool batting that would shield most people with latex allergies. 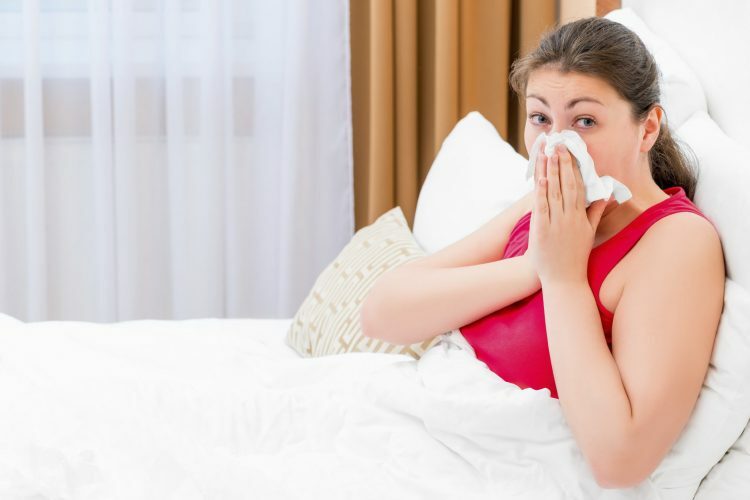 Allergic contact dermatitis can spread around the body and occurs four days after contact with latex, but again, you’d have to be directly touching the inner layers of the mattress themselves. The most serious type of allergy is known as latex hypersensitivity with symptoms like pink eye, cramps, hives and severe itching. One person diagnosed with latex hypersensitivity recalls: “I did not sleep more than four hours per night, tossed and turned, and lately felt like I was burning up inside.” In some instances, the symptoms are much more severe, including: rapid heartbeat, tremors, chest pain, difficulty breathing, low blood pressure and deadly anaphylactic shock. Memory foam mattress allergies are rare, but if you are concerned about being allergic to memory foam chemicals, then try 100% natural Talalay foam latex – which is made from pure tree sap of the rubber tree. On the other hand, if you’re allergic to latex, then you may want to try memory foam – which is made from high-density polyurethane. Either memory foam or foam latex would be a superior choice to traditional inner spring mattresses if you are looking to have a dust-mite-proof mattress. The type of mattress you buy matters less than the type of special mite-proof covers purchased for your mattress and pillows. The best mattress cover for allergies is one that does not allow mites to penetrate, but is soft to the touch. People who are worried about being allergic to pillow stuffing can find many different types of pillows on the market geared toward allergy sufferers in particular. The type of pillow stuffing you choose boils down to a matter of personal preference, so it’s best to speak with a qualified Sleep Specialist at Mattress World Northwest to discover which choice may best suit your needs. Always keep in mind that in most cases the pillow itself matters not nearly as much as the type of cover you put over it. Viscoelastic memory foam and natural latex are the best options available to sleepers concerned about dust mite allergies. Mattress World Northwest – with multiple locations across the Portland, OR area – offers top brands like Simmons Beautyrest, OMI Naturals and others. If you are worried about latex allergies, our knowledgeable Sleep Specialists can steer you toward some of our non-latex foam, or inner spring options, depending on your budget and comfort preferences. Find a mattress store location near you!